Welcome to The Return of DUM DUM Zine! DUM DUM Zine is a literary collective publishing experimental art, music, and literature, changing format with each issue. Named a “cult favorite” independent publication by The L.A. Times, this year we’re going back to print and celebrating with our Issue No. 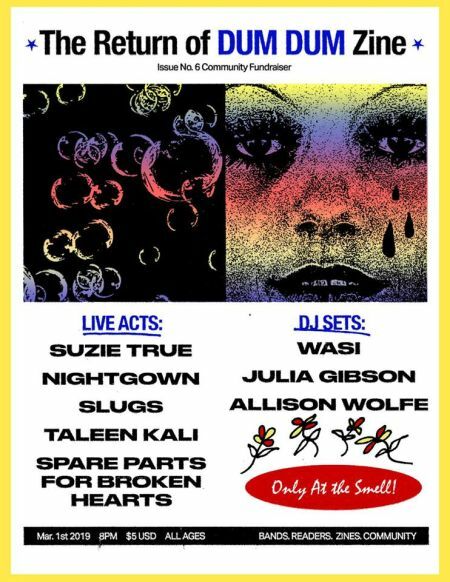 6 Community Fundraiser March 1st at The Smell! Join our growing collective of Dummies, donate to our spankin’ new Kickstarter campaign (launching this Tuesday, February 26! ), and ask-an-editor IRL about our upcoming Issue No. 6: “REST & RESIST” submission process. Plus fun surprises for all your DUM literary needs!